Hi! It's Jilly. I'm happy to have Jessica from All She Cooks with us today! She is sharing a fantastic Pumpkin Pancake recipe that I can't *wait* to try out! And, while you're here, be sure to enter to win a copy of Jessica's eBook, "Serious Blogging: Tips and Tricks to Put YOUR Blog On The Map". It will blow your mind! Now, let's see that beautiful pumpkin recipe! Hello, Hi! It's Jilly readers! I'm Jessica from All She Cooks, and I'm so excited to be here with you today sharing one of my fall-flavored breakfasts (I almost said desserts!) for you today. Nothing says the start of fall like pumpkin. Okay... maybe the crisp cool air, or colorful leaves falling on the lawn and blowing in the wind. But, when it comes to cooking, it's all about pumpkin. 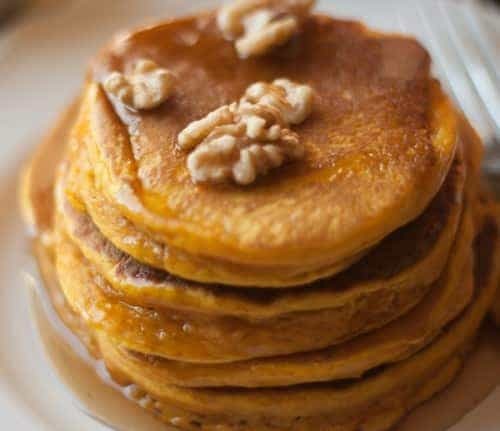 These Hearty Pumpkin Pancakes will surely start your fall morning off the right way, and don't be surprised if you bite into them and feel like you're taking a bite of delicious cake instead. Or maybe that was just because I happened to add a dollop of whipped cream to mine. 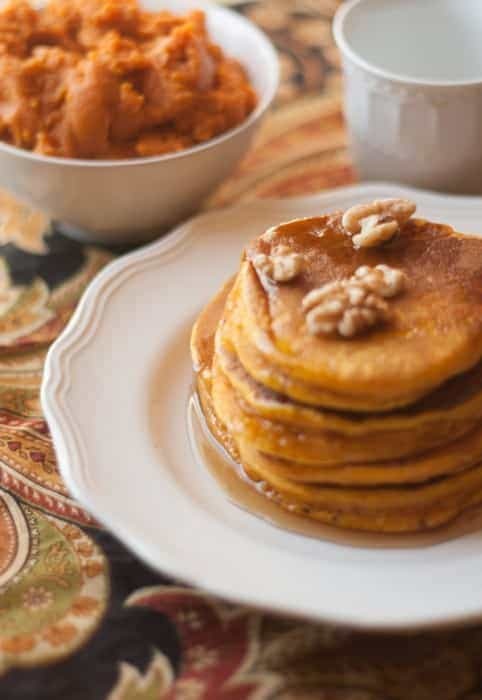 Our Hearty Pumpkin Pancakes are easy to throw together in the morning, and are perfect for a school morning breakfast. And they are KID-APPROVED! You can't beat that. My own (sometimes picky eater) 10-year old daughter gave these Pumpkin Pancakes two thumbs up. And then I brought her to school to get on with her day. What a great start to her first full day of middle-school, if I do say so myself. Then, being the crazy food blogger that I am, I came home and had a little photo session with these Pumpkin Pancakes. They cooperated rather nicely. By that point, I was starving!! I heated up the great big stack of pancakes pictured in these photos and put some whipped cream on top... because for some reason I can't get pumpkin pie out of my head, and I always have whipped cream on pumpkin pie. Breakfast with whipped cream... to me it was like eating pumpkin cake. Which I haven't made yet, but am all over creating! Be on the lookout for more of my fall-inspired pumpkin creations, because I can tell you right now, I'm not finished working with pumpkin. Pumpkin fan? Follow me on Pinterest and check out my PUMPKIN! board. I'll be pinning my own and other fun and fabulous pumpkin recipes that I see over the next several weeks. 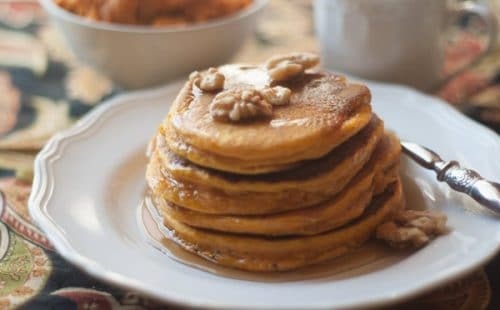 These Pumpkin Pancakes have just a couple tablespoons of brown sugar to sweeten them up, but we all know you're likely going to drench them in maple syrup or honey anyway. Or whipped cream like I do. You can mix together the dry ingredients of our Hearty Pumpkin Pancake's batter the night before, or if you're looking for an ultimate time-saver, make up several batches of the dry ingredients and then just add your wet ingredients when you are ready to make breakfast. I'm planning to do that myself and will most likely use some of my Mason jars to store the dry ingredients because I have a TON of jars around my house and my garden was an epic fail this year, so no canning tomatoes. Unless I happen to find some canning tomatoes at the farmers market this late in the season. Fingers crossed, because I don't know what I'll do this winter without my jars of whole tomatoes... and homemade salsa. I had such big plans! 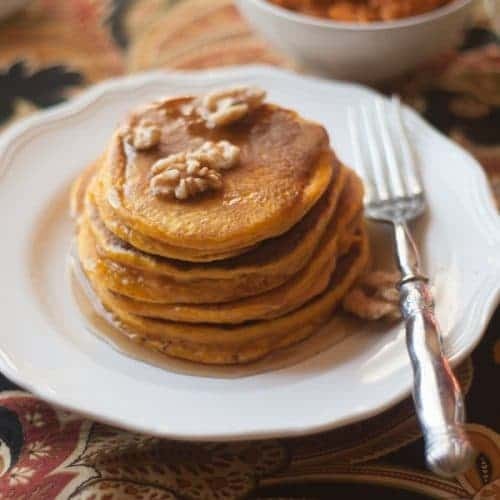 Super simple ingredients for these pancakes, and like I said, you can mix up the dry ingredients ahead of time and add the wet ingredients when you're ready to make your sensational Pumpkin Pancake breakfast. Your dry ingredients: flour, brown sugar, baking powder, and salt. Wet ingredients: egg, milk, vegetable oil, and pumpkin. Did you notice... no pumpkin pie spices. You can add some if you choose, but in all honestly, these pumpkin pancakes really didn't need it. They don't taste like pumpkin pie, but the do taste glorious. What's more, they are moist and just plain good. Remember I said they reminded me of cake? I'm thinking I might make a Carrot Pancake variation and swap out the pumpkin for carrots. Maybe add some raisins. What a way to get some veggies in first thing in the morning! This breakfast would go really good with a Brown Sugar Cinnamon Low-Fat Latte or hot cocoa with a cinnamon stick, maybe some apple cider. I know... it's only the first week of September and all I can think about is fall! Blame it on all the stores putting the Mums out right where I can see them when I drive by, or Hobby Lobby (oh how I love you!) that had fall decor out in early summer, and Christmas decor out shortly afterward. It's hard NOT to get a jump start on fall when everyone else is. And hey- I live in the Midwest, so we'll probably end up with very fall like weather within another week or two. 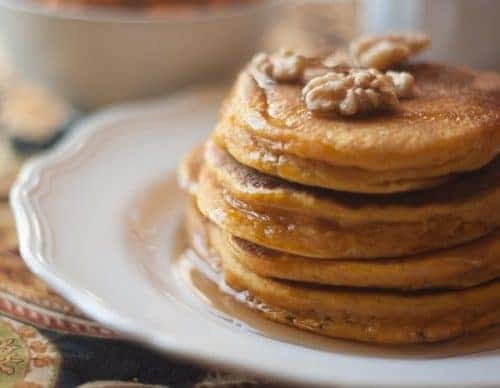 I SO hope you enjoy my Hearty Pumpkin Pancake recipe, and thanks so much to Jillian for having me as part of her Fall in Love with Fall series. Mix all ingredients together. Heat pan on medium-low and spray lightly with cooking spray. Cook on each side for 1-2 minutes or until lightly browned. Serve with chopped nuts (optional- we used walnuts), syrup, and/or honey. Thanks so much, Jessica! Maybe my picky daughter will like them, too. She says she doesn't like pancakes. Who does that?! I hope you are enjoying the Fall In Love With Fall Series so far! I know I am! Be sure to follow on Facebook, Twitter, or Pinterest to see the coming posts, or sign up for my newsletter and get each new post straight to your inbox!